The state board of education passed two measures on Wednesday morning returning full local control of the Paterson school district ending almost three decades of state takeover. One resolution returned the two remaining areas — instruction and program; and governance — to the local school board while another withdrew the state from the district. Both measures were passed unanimously prompting three dozen Paterson community leaders, district employees, and others to break into applause. “I know it’s going to be a glorious day in Paterson,” said school board president Oshin Castillo after the vote. She attended the meeting in Trenton with four – Nakima Redmon, Vincent Arrington, Emanuel Capers, and Manny Martinez — of her school board colleagues. Superintendent Eileen Shafer vowed to ensure her administration “stays focused” on the education of her 28,000 students. “We will continue to increase our performance as a functioning school district,” said Shafer thanking her almost 4,000 employees for their hard work. She recognized the work of education advocates in regaining local control. “It’s been a long time coming. Today is the beginning of a new and exciting future for the Paterson school district, the community, and our children,” said Rosie Grant, executive director for the Paterson Education Fund. The city’s both state assembly representatives were at the meeting. Assemblywoman Shavonda Sumter said parents will finally have a say in the education of their children. She credited past school board members for their work in making the return possible. “Each of you moved the ball up the field, year after year, since 1991,” said Sumter. Former school board members Christopher Irving, Chrystal Cleaves, William McDowell, Errol Kerr, Corey Teague, and Theodore “TJ” Best were present during the vote. “Thank you, all, for making this happen,” added Shafer. The district earlier in the year scored over 80-percent in all five areas under the Quality Single Accountability Continuum (QSAC), a metric the state uses to evaluate public school districts, paving the way for Wednesday’s vote. In 2014, the state returned operations. In 2016, the state handed back fiscal management and personnel. Paterson was placed under state takeover on Aug. 7, 1991. A state report described superintendent Frank Napier as incompetent. His “management was characterized by an inability to demonstrate an understanding of the role and function of a chief school administrator,” according to the report. Napier was criticized for being isolated from daily operations and lacking vision for the district. Oddly, Wimberly repeatedly invoked Napier at the meeting on Wednesday. At one point, he said Napier would be proud to see local control restored to the school board. The school board at the time was described as inept and busy with petty squabbles rather than focused on providing a good education to its students. State board member Ronald Butcher voted for the takeover in 1991. A way was created with QSAC in 2007. 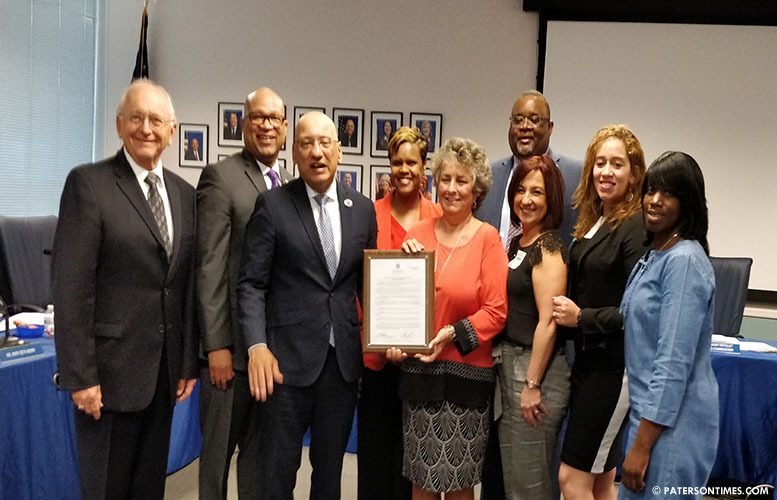 “This is an important milestone for the students, parents, educators and leaders of the City of Paterson that worked diligently to improve district QSAC scores.” said state board of education president Arcelio Aponte. “This is a result of collaborative efforts that involved parents, students, teachers and administrators who, working with the educators at the Department, helped put the systems in place for improved academic achievement and stable governance,” said acting education commissioner Lamont Repollet. Both the state and the local district will work to create a transition plan. It could take as long as two years before the local school board is effectively in charge of the district. Paterson became the latest district to start the process to shed state control. Last year, the state board voted to return control of Newark and Jersey City to their local school boards. “I want to make sure we don’t keep our eyes off the kids in Paterson. It’s still a state responsibility to make sure they have access and equity,” said state board member Fatimah Burnam-Watkins. With corrupt Oishin Castillo we will be back under state control in no time. Do you think this BOE will say no to charter expansion and their leeching of funds from the public school? If Castillo's PCT vote and the other BOE members taking bribes, and favors from vendors etc is any indication they are open to the highest bidder. Good day for the city of Paterson and the Paterson Public School. Long overdue. Almost 30 years.